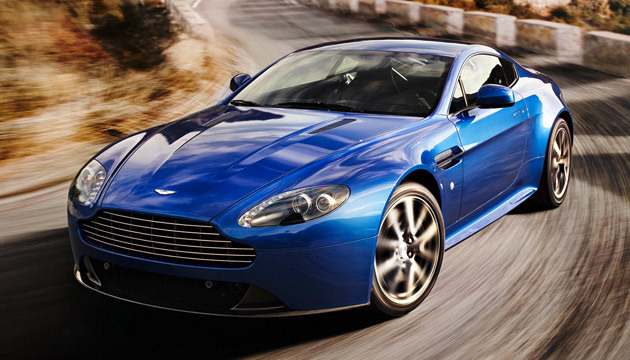 "SENSATIONAL DESIGN, EXQUISITE CRAFTSMANSHIP AND PHENOMENAL PERFORMANCE COMBINE TO MAKE THE 2012 V8 VANTAGE THE CHOICE FOR THE DISCERNING SPORTS-CAR DRIVER." Aston Martin has revealed a small but important raft of updates to its baby supercar, the V8 Vantage. In short, the new, revised, 2012 Aston Martin V8 Vantage gets the new seven-speed Sportshift II auto box from the Vantage S, as well as quicker steering, bigger brakes and wider tyres, all aping the S.
So essentially, its an Aston Martin V8 Vantage after a three-month Men's Health cover model plan; a touch harder, sharper and more defined. Aston has left the 4.7-litre V8 unchanged, so you're still looking at 420bhp and 469Nm of torque (meaning a 0-100kph time of 4.8 seconds). But it has replaced the optional six-speed auto with the newer, better, optional Sportshift II ‘box from the Vantage S; a unit that features closer ratios, a lower final drive and a quicker, refined shift quality. A manual is standard equipment, naturally. And that new steering column is built on a quicker ratio of 15:1 rather than 17:1, while braking now comes courtesy of new 380mm two-piece ventilated cast-iron front discs and six piston calipers. The tyres are 10mm all round, and Aston has subtly - very subtly - updated the looks, taking cues from the Vantage S and vegetable-crunching N400 limited edition. A lower front bumper with aero splitter gets a larger air intake feeding cold stuff to the engine and brakes, there's a new rear diffuser and inside, Aston has fitted sculpted ‘race-derived' side sills. A good thing made minutely better, or has this update failed to sate your thirst for more?